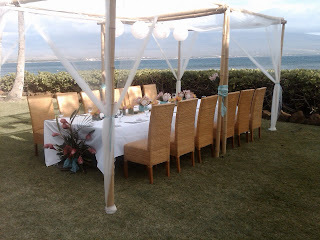 Kailani House on Maui's south shore is one of the few remaining private homes still there. Surrounded beyond it's several acres of yard by condos, this open floorplan home is the host to many fortunate Brides. 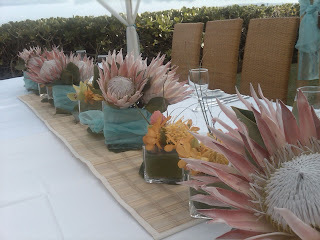 Yesterday, as the whales were performing just off shore, we set up a Dining Canopy and some awesome table arrangements using Maui's famous Protea flowers. It was absolutely stunning. The wind was up, but the house sheltered everyone perfectly!